I love vinegar and vinegary foods. Pickling carrots and parsnips is how I’ve been getting my vinegar groove on lately. 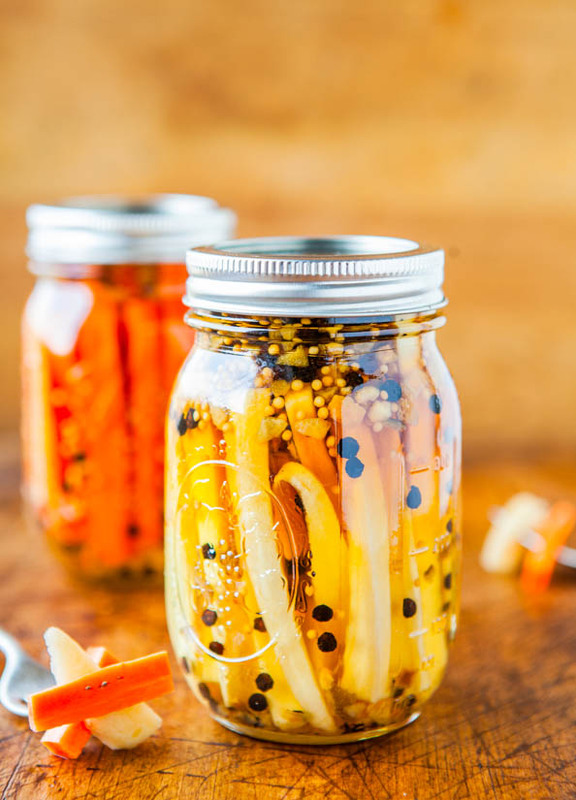 If you’ve never pickled anything, this method is so fast and easy, and you have nothing to fear. It’s a 10-minute project, and a perfect way to bottle up summmertime. Or any time you have extra vegetables. To make the brine, I simply combined equal parts white vinegar and sugar in a saucepan, brought them just to a boil, and poured the syrup over raw carrot and raw parsnip spears that were waiting in jars. To each jar, I added a few tablespoons of dry yellow mustard grains and some Salt-Free Citrus Pepper Blend, a blend of lime, orange, and lemon rinds paired with black peppercorns. Most people add salt to pickle vegetables, but I avoid cooking with or adding salt to our food as much as possible for health reasons. With the right blend of other seasonings, there’s plenty of flavor and a bit of a kick from the mustard grains and peppercorns. No salt needed. Plus, parsnips naturally have a peppery kick, and the spice blend enhanced it. Think outside the box and try Jerk seasoning, chipotle seasoning, mesquite grill seasoning, or Indian spices like curry or garam masala. 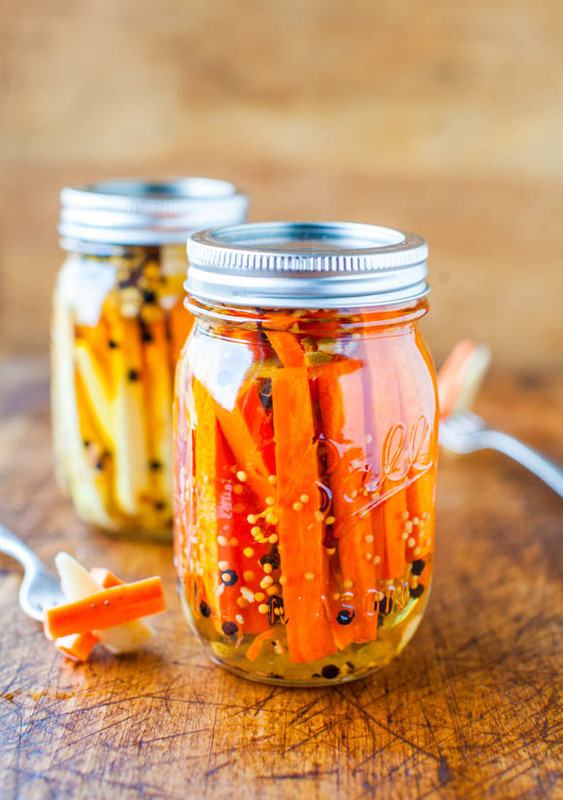 Pickling doesn’t just have to mean Kosher dills. The vegetables become tenderized and softened after a few hours, but the full effect and flavor of the pickling sets in a day or two later as the flavors marry. I used carrots and parsnips because they’re quite firm to begin with and I wanted the finished veggies to be firmer and not mushy. They retain plenty of texture, crispiness, and crunch. Cauliflower, rutabaga, beets, and turnips are next. The vinegar brine is tangy and sweetish, with a gentle kick from the mustard and peppercorn. Sweet with heat, of sorts. And vinegar has plenty of health benefits. I’ll consider myself super healthy then with all that I’ve been consuming lately. 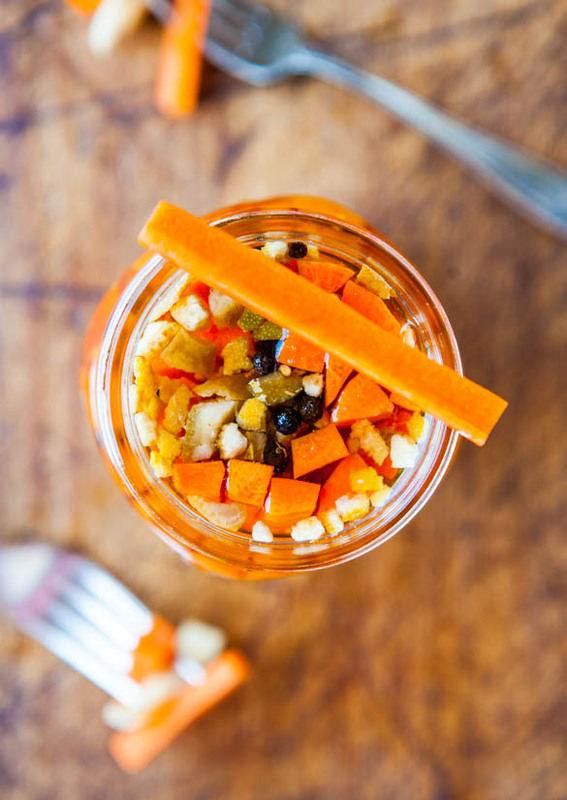 Even if you’ve never pickled vegetables, this quick and easy method will leave you feeling like an old pro. It takes just a few minutes to prep the vegetables and place them in jars before dousing them with an easy vinegar-sugar syrup. The veggies are softened yet retain crunchy texture and some crispness. 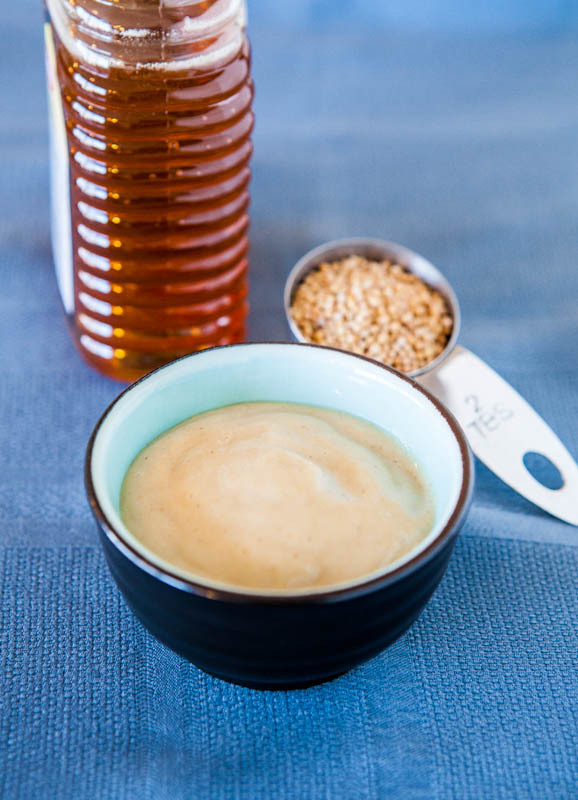 You won’t miss one bit of flavor in this salt-free recipe that’s a bit sweet, very tangy, with a slight kick from the yellow mustard grains and black peppercorns. They’ll keep for many weeks in the fridge. 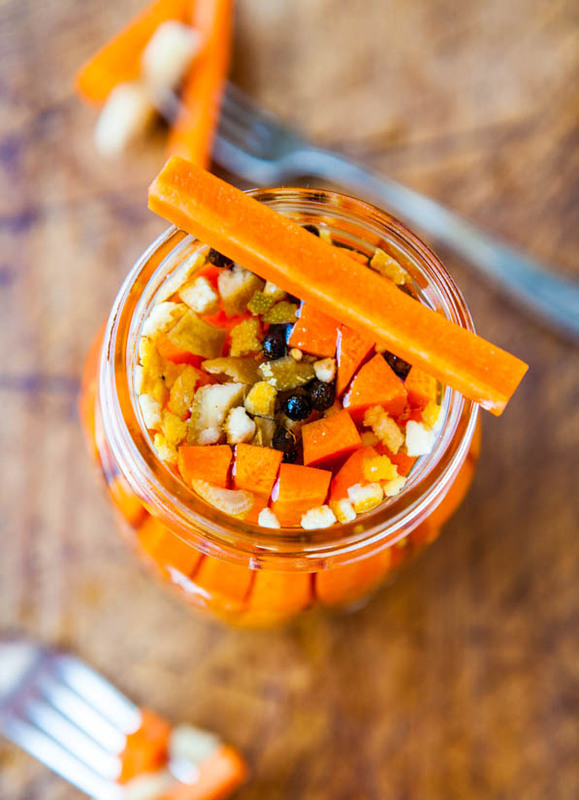 Place trimmed and sliced carrot spears in one glass jar and parsnips in another glass jar (or mingle them, if preferred); set jars aside. My jars were very well-packed and very stuffed; I couldn’t fit in any more spears. In a medium saucepan, combine sugar and vinegar and heat over medium heat to dissolve sugar, stirring constantly. Allow mixture to come to a boil and then shut the heat off. Pour the mixture over the vegetables, divided equally, or until the liquid comes up to nearly to the top of the jar. I find it’s easiest to pour the vinegar-sugar mixture into a heat-safe, large, glass measuring cup rather than trying to pour from a saucepan directly over the vegetables since more seems to spill onto the counter than get into the jars. Add 2 tablespoons citrus pepper blend and 1 tablespoon mustard to each jar. If adding salt, add it to each jar, to taste. Seal jars and shake gently to disperse spices. 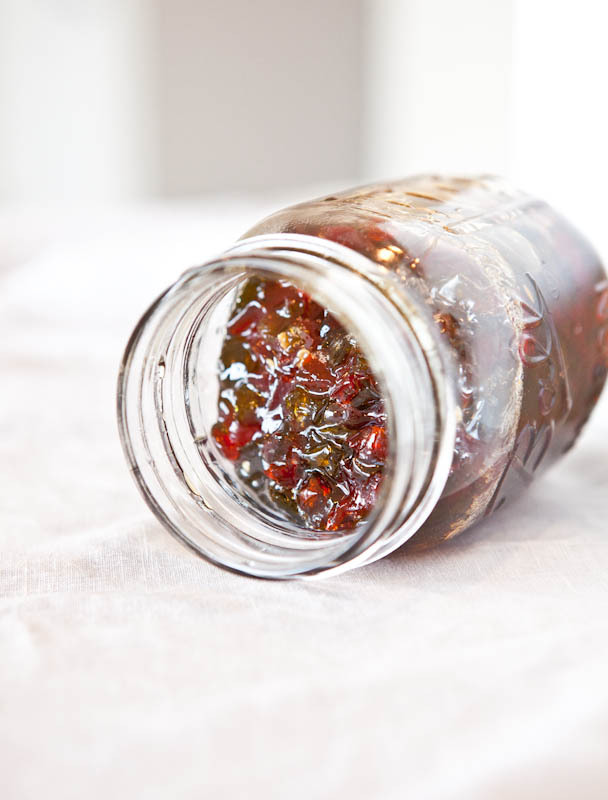 Allow jars to cool on counter before transferring to the refrigerator. Do not put hot glass jars into a cold refrigerator, they could crack. Vegetables will be ‘ready’ after about 2 hours, but the full effect of the pickling will set in about 48 hours later. 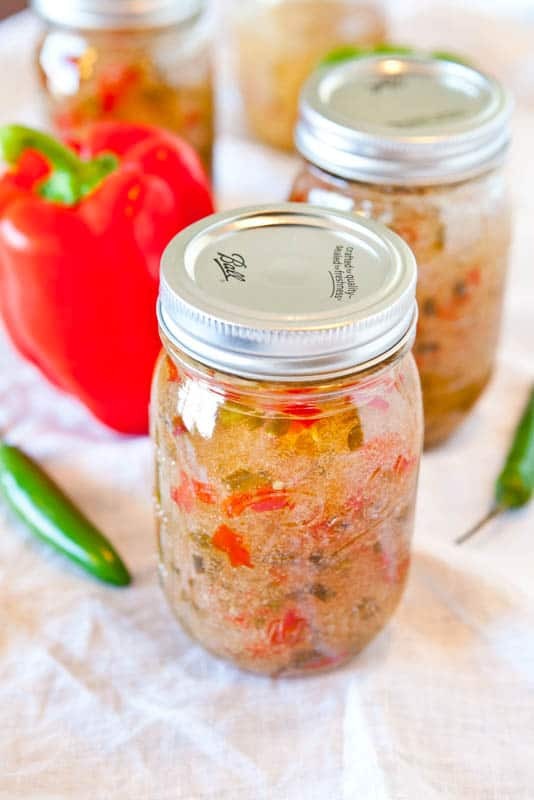 Vegetables will keep refrigerated in jars for many weeks; let common sense and your tastebuds be your guide. Optional tips and suggestions – Try using other vegetables such as cauliflower, beets, turnips, rutabagas, cucumber, or firmer vegetables. Think outside the box and add spices and seasoning blends like Jerk seasoning, chipotle seasoning, mesquite grill seasoning, or Indian spices, garlic or onions; add fresh herbs like dill or thyme to the jars. If desired, add salt to the brine, to taste. Have you ever pickled anything? Favorite recipes or items you like to pickle? Vinegar fan? Such a healthy snack Averie. I need to focus more on veggies. This inspires me! 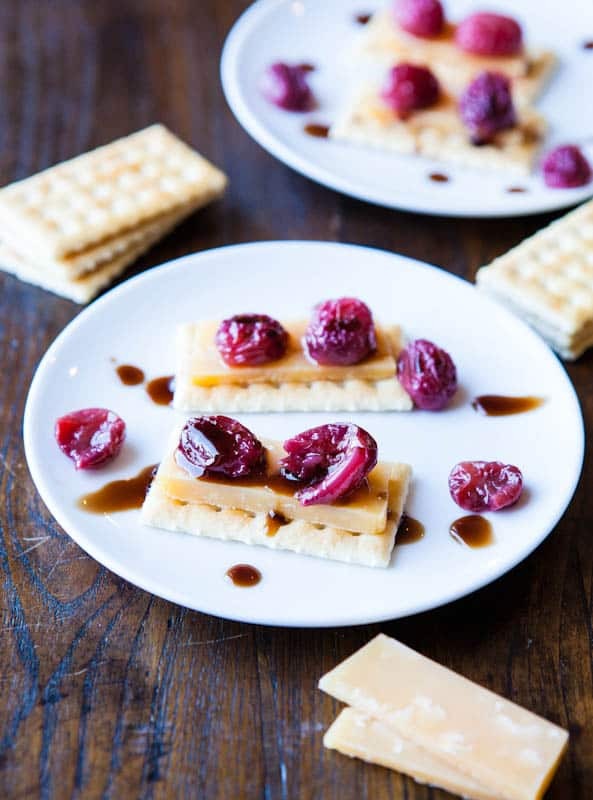 Yum – my lips are puckering – hey, neighbor, come over to my herb garden and I will share 4 different kinds of thyme for “pickling”. Lovely, Averie. I also love pickled vegetables. Especially carrots and parsnips. You have brought back memories and I will be making these soon. Thanks so much. 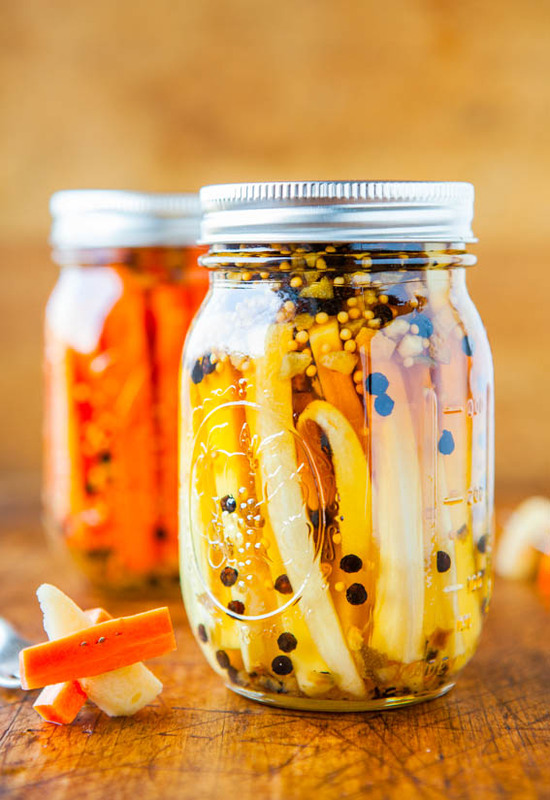 I can easily go through a jar of dill pickles in an hour – I never even thought about making my own pickled veggies! 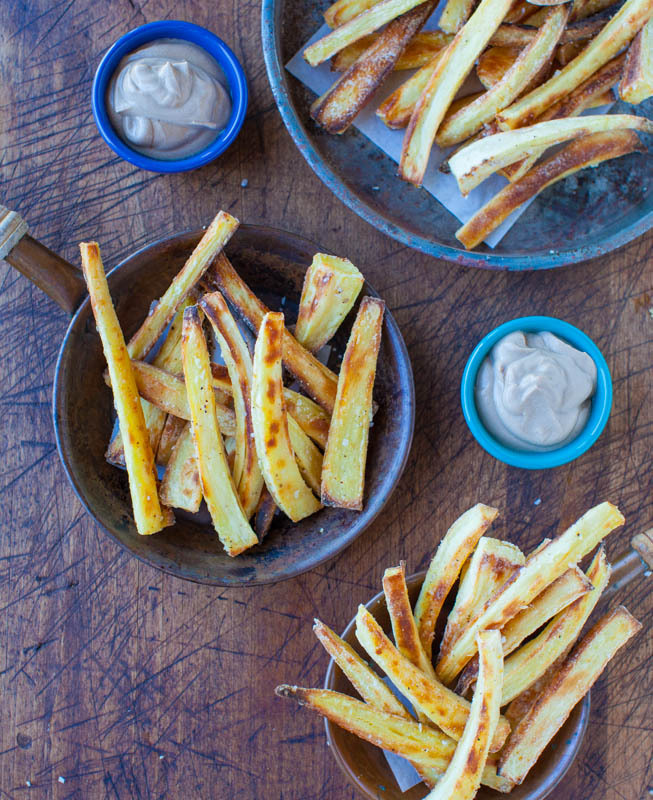 *Love* the idea of using parsnips!! I followed your link to the spice blends. I found the blend you used, but it came in a grinder. Do you open the grinder or did I miss the opportunity to buy it without the grinder attachment on the bottle? I opened the lid and just dumped them right in. Lid comes off very easily. Yum i love pickled vegetables (and some fruits even!) and they pack so much flavor with relatively few calories. Pickled carrots especially, with Mexican places they can be so hit or miss. Your pictures are great!! 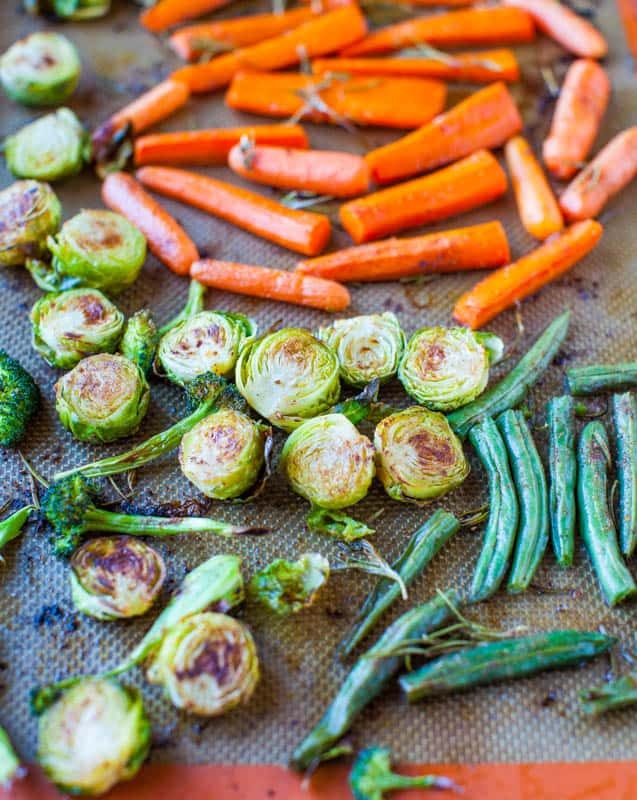 I love how the veggies just pop! ;) I must find time to try pickling something!!! Thanks for the motivation! 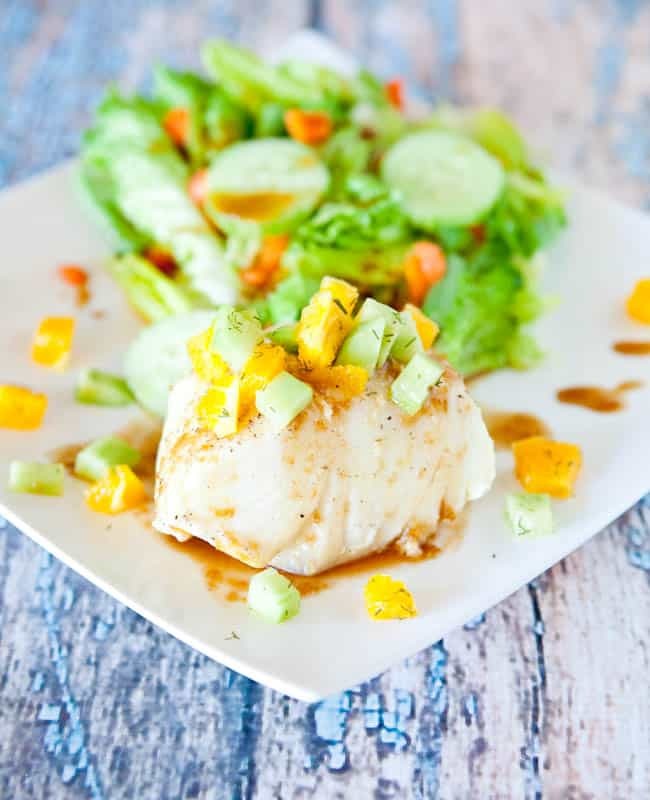 I got my vinegar groove on too–these were absolutely great! 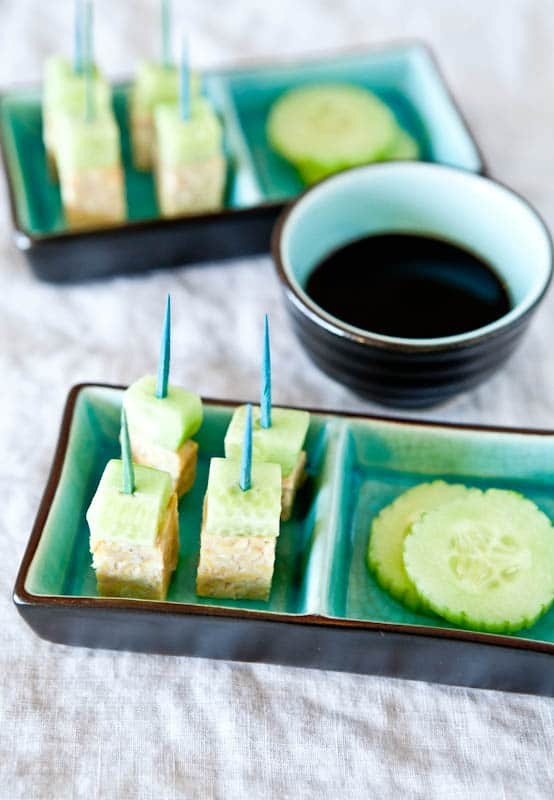 I’ve had store bought pickled veggies and wasn’t a fan, but these…..sooo much better! I used baby carrots and beets (I steamed the beets and peeled them) and golden balsamic vinegar so the carrots wouldn’t turn dark. The only drawback is that white/golden balsamic is pricier, but it was worth it (I got the cheapest bottle I could find and needed 2 of them). They do taste best on day 2..the hard part is waiting. Great recipe Averie (and easy too)! This looks great Averie! My garden is starting to produce some veggies and I am always looking for new ways to enjoy my harvest. 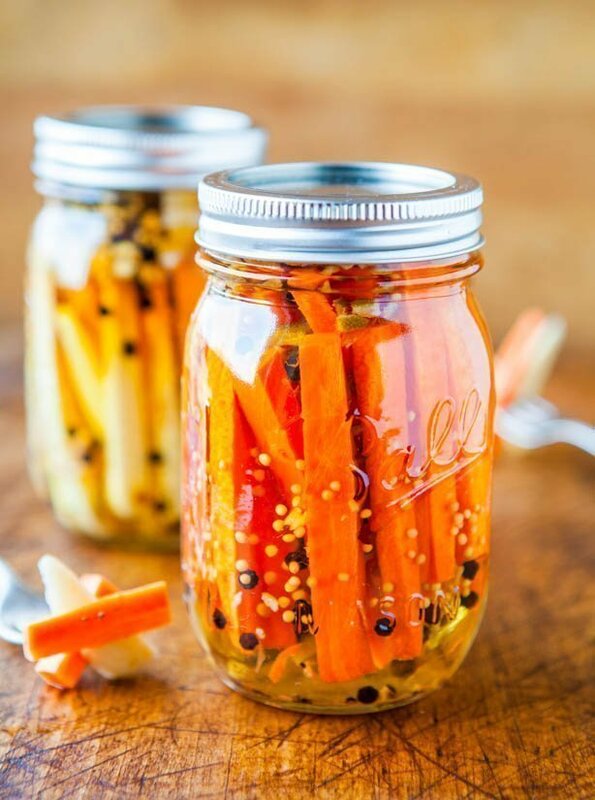 Pickling is a great alternative to canning. I planted beets this year and am really like Paula’s suggestion of balsamic beets, sounds delicious. If you try them, any version, LMK! 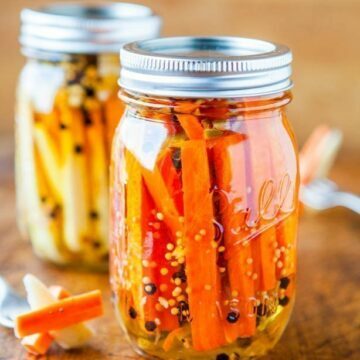 This is a great idea and for kids who love pickles why wouldn’t they love pickled carrots?? Everything on your page looks so yummy too! I loooove making homemade pickles and these look really tasty! But you know what? I’ve never tried a pickled parsnip. Sounds delicious! I love that they stay nice and firm with plenty of texture and don’t get mushy – and that little bit of peppery-ness is good too! Does anyone have any good ideas for pickling without sugar or carb-heavy sugar substitutes? How about using this method to pickle eggs? I’ve been dying to try pickled eggs for a while, but I’ve been put off by long recipe lists that usually include the words “pickling spice” somewhere (what the heck is pickling spice and where do I get it???). I have never heard of pickling eggs and really have no advice for you! Good luck though! If you can drink straight vinegar, no sweetener, you have more hair on your chest than I do, and I love vinegar :) I would just use the sugar because you’re not drinking the brine and on a cellular level, your body really isn’t going to process honey any ‘better’ than sugar; sugar is sugar is sugar. I personally think stevia would be gross in this recipe and I like stevia, but not here. I haven’t tried canning them but almost anything can be canned. You just have to figure out how long to boil for, etc. and I haven’t tried so can’t give you the exact info, but I would just google a bit to find out what’s normal & recommended and go from there. After putting the lid on the jars, can this recipe be water sealed and stored in a cool dry pantry? Or is this a fridge only kind of recipe? Don’t know much about pickling/canning..anything. I’ve only made this recipe the way I wrote it and can’t really speak to other options or methods. Good luck! I pickle beets from the garden, nothing better than home grown. I boil then simer till fork tender then peel and slice. I also use pickling spice and cook with the vinegar mixture. They last the entire winter and everyone loves them. I also sliced small 1-1/2″ zucchini into a jar and made a tarter brine that is delicious.